Your small donation helps maintain and grow this website and cover website hosting costs. Thank you! Check out the latest updates and news! TheFuturoHouse.com in the press and on loan. How Did They Get To Where They Were Going? 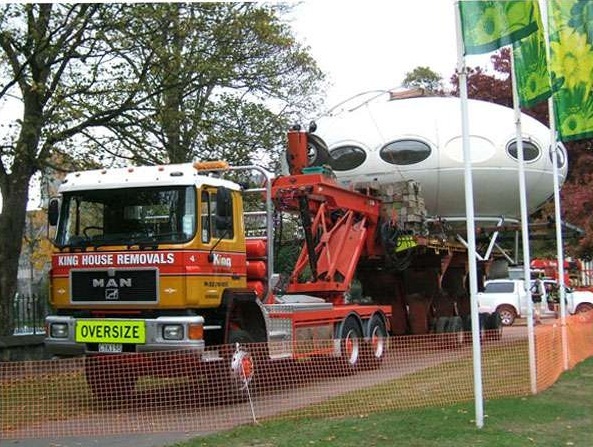 Just how do you transport a Futuro House? Where Are They Now [Or Where Were They]? The most complete & up to date list on the web. Where Are They Now Mapped Out? Google Map showing the current locations of known Futuros. "Futuro Stuff" that does not fit anywhere else. A photo gallery of unusual "Futuro Shots". My personal collection of "Things Futuro". Historical documents from the Futuro Corporation Of Colorado. Smaller historical archives and collections. All manner of Futuro related material - web, print, video etc. If you have any information or photographs related to the Futuro that you can share please contact me using the Contact Form. This website contains many external links and references and over time some of these will almost certainly "break". If you find anything "broken" please let me know using the Contact Form. Help An Obsessed Collector Spend More Of His "Hard Earned"
If you have or know of any books, magazines, photographs or other Futuro related items that are for sale please let me know using the Contact Form. I will pay top prices for all things Futuro. I have many books, magazines etc. in my Collection and a fair number are in languages other than English; these may contain new information about one or more Futuros but without translated text that information cannot be added here. If you are able to translate something I can provide high res files for that purpose. Look for the icon on the Collection page; it can be used to send me an email regarding translation of a particular book or document. All images used on these pages are attributed by means of a name and a link to the original image or article containing the image. Where necessary permission to display the image has either already been given or there has not yet been a response to a request for permission that was made at the time the image was added. 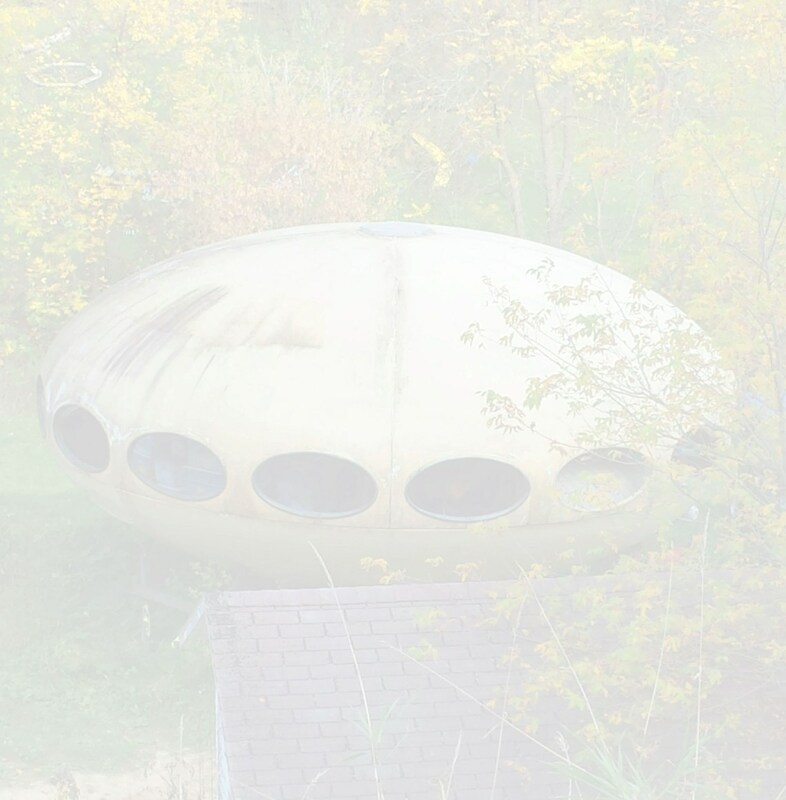 I used to wait until I got a response to requests before publishing but in 100% of requests made since I started researching the Futuro House around 24 months ago I have always been given permission to use images. Therefore going forward I intend to request permission as I always have but publish images with appropriate attribution at the time so I do not subsequently have to go back and edit pages to add them. If you find an image you own used on one of my pages that you would like removed please let me know and I will do so immediately. If you would like the attribution used for one of your images altered please let me know and I will make the appropriate edits immediately. 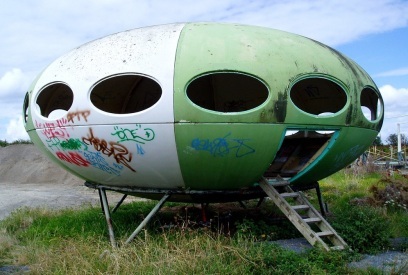 Please note that this website is the new home of The Futuro House Project. Where permission was granted to display images on that original site I have assumed the permission holds true for this new permanent home on its own domain. Please let me know if you own an image and do not wish it to be used on this new site let me know. You can contact me by email or by using the Contact Form. While You Are Here Why Don't You Check Out Other Cool Architecture On Our Blog? SO JUST HOW DID THEY GET TO WHERE THEY WERE GOING? 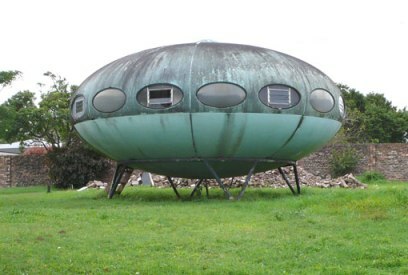 Given the [original at least] perceived main use of the Futuro as a "ski cabin" one of the primary design considerations was ease of transport. By its very nature skiing tends to take place in more rugged and sometimes difficult to access, terrain; I do not ski but I figure skiing on a flat plain would likely not be the best skiing. The choice of materials made the Futuro relatively light and it's construction in 16 pieces made it more convenient for transport. Primarily there were two methods of transport available. A Futuro could be transported in 16 pieces by road and then assembled on site [or presumably rail though I have been able to find no evidence of this to date] or it could be air lifted by helicopter. 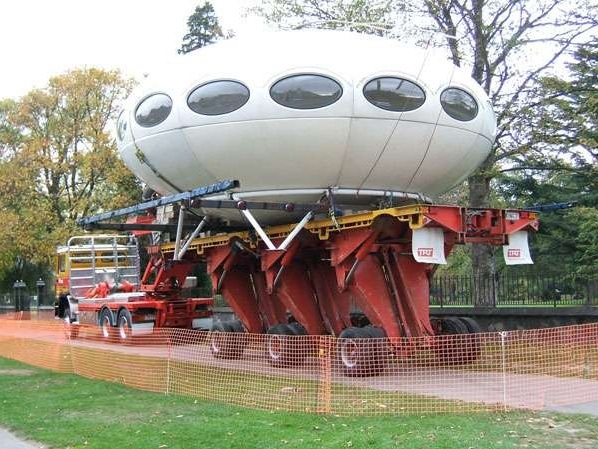 Though not specifically advertised as far as I can tell during the early [manufacturing] days a Futuro could also be transported by road fully assembled. Though its size makes this a monumental undertaking even over relatively short distances modern examples of this mode of transport exist and some are well documented. "Woodbridge, New Jersey - An S-64 Skycrane, built by the Sikorsky division of United Aircraft Corporation, Stratford, Conn., recently airlifted a (FUTURO) Bank Branch Unit and placed it on its site in the main parking area of the Woodbridge Shopping Center here. The unique structure owned by the City Federal Savings and Loan Association is called a "space Bank". It is a factory built spheroid 26' in diameter, 12' feet high, containing 5,000 cubic feet and weighing 13,500 pounds. * It was flown and placed with interior appointments including carpeting, teller counters, cabinets and seating. Electrical and telephone connections were made immediately and the bank was opened for business 30 minutes after it was lowered from the sky. * Including the weight of the safe and other banking equipment." I had thought that the video below was of the same transport event but looking at the photo and the video the helicopters are clearly different; in the photo there is a twin rotor craft [appears to be a Boeing CH-47 Chinook to me] and in the video a single rotor craft [which I believe is an S-64 Skycrane as mentioned in the text accompanying the photo]. There appear to be a couple of possible scenarios; there were two "space bank" transport events and the image in the document was incorrectly associated with the Woodbridge Shopping Center "space bank" or there was a single event and again the image used in the document was of another transport not associated with the "space bank" transport. Further research is needed here and I will update as and when I have clarification. [Edited 082413 - Scott Hedges sent me some Futuro information and among it were some photos and other information pertaining to the photo above. The markings on the helicopter are actually Swedish Air Force and in addition there are indications that the train is also Swedish. 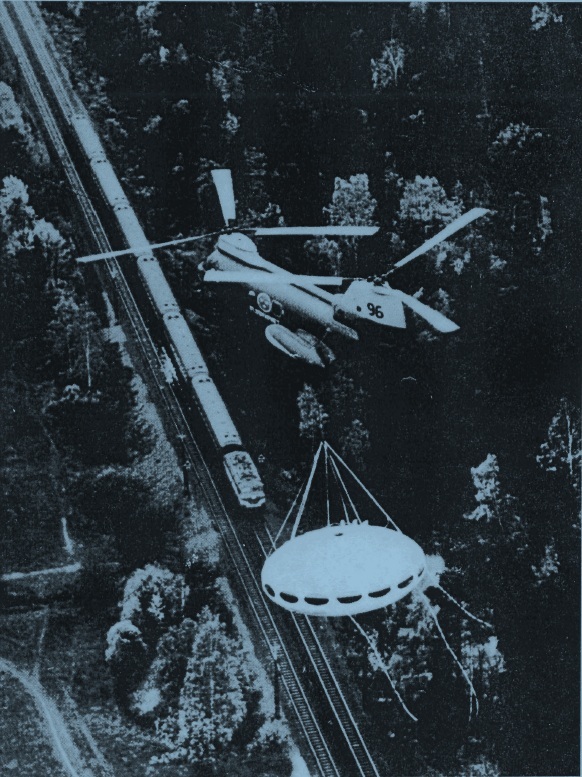 While it is possible - though unlikely - that a Swedish helicopter would be transporting a Futuro in North America there is little chance a Swedish train would be traveling on US tracks. If that was not enough some time ago I purchased a couple of photos of a documented Futuro transport that took place in the Stockholm area on 102269. You can access a copy of one of them here [please note this image is watermarked and should not be reproduced - while I purchased copies I do not own the copyright]. 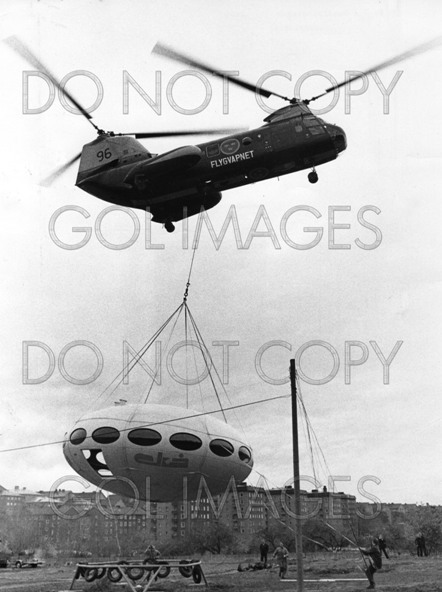 This image shows a Futuro being transported by a helicopter which is clearly the same model as the photo above. In addition the helicopter carries the same markings down to the number 96 at the rear. 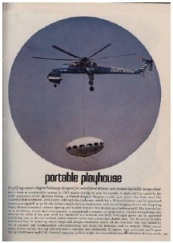 Finally the method by which the Futuro is slung under the helicopter looks exactly the same. While I cannot be certain I am of the opinion that these two photos depict different stages of the same transport event that took place 102269 in the Stockholm area]. I have been unable to locate any images or videos of road transport from the early days but there are well documented cases from more recent times. In December 2004 Futuro owner Milford Wayne Donaldson oversaw the move of his "baby" from San Diego to a rocky Idyllwild mountain top in the San Jacinto Mountains of California. Donaldson had purchased the Futuro that had been located in Hillcrest Canyon, San Diego since 1977 in 2002 and after, being at a temporary location for refurbishment, it was making the move to what Donaldson hoped would be its final home. Considering the Futuro had ease of transportation as one of its primary design considerations the five hour journey was perhaps a little more complex than one might have imagined. Preparing for the trip involved months of extensive planning. A passable route had to be devised; not too difficult on the freeway portion of the journey maybe but once up in the mountains there were sections where clearance dropped to inches and trees had to be trimmed to allow the Futuro through. There was the flatbed to arrange, pilot cars to arrange, highway patrol escorts to arrange and permits to obtain. 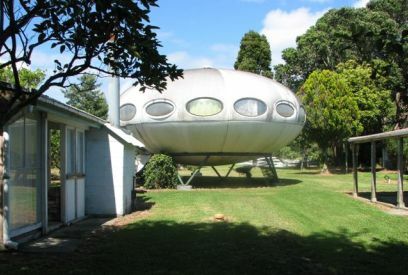 "We've moved a lot of strange things, but that's the first flying saucer house we've ever moved." 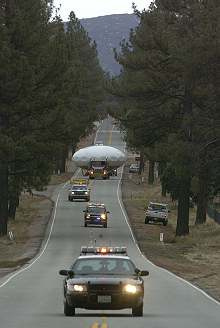 "And in downtown Idyllwild, the entire crew held its breath while more measurements were taken before the Futuro - which measures 26 feet wide - headed for its tightest squeeze: Only 4 inches to spare, ideally 2 on each side, between hefty trees that hug the road. Driver Larry Wood cleared it on the first try." An image of the Futuro on the road is above left [source: JoelInSouthernCA]. You can see clearly the Futuro overhanging both sides of the roadway and the vehicles that had to pull completely off the road to get out of the way. 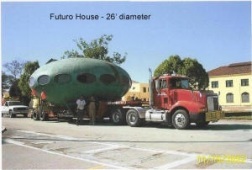 The image to the right is from the moving company's website, San Diego Boat Movers [Edited 072012 - page no longer available - access using Wayback Machine here], and shows the Futuro on the flatbed before being wrapped in its protective "blanket". moved a Futuro by road from Christchurch to Harewood in New Zealand. The following two photos of the Futuro loaded up and ready for transport are reproduced with the permission of King House Removals. 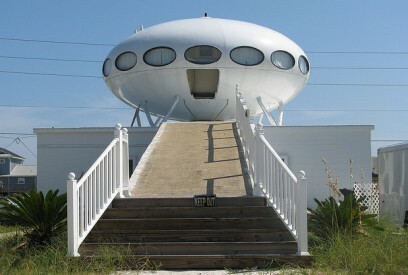 "Damon plans to live in the Futuro at the marina or on a lot nearby, as the cost to transport the house is infeasible. Often, helicopters were used to carry Futuros to their destinations, but Damon estimates it would cost him about $100 per mile to do so. 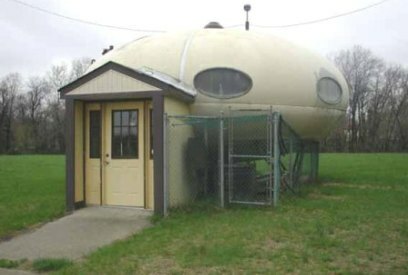 The permitting and costs required to put the saucer-shaped house on a flatbed and drive it up to Damon's home in Tuckahoe, N.Y., also would be unrealistic, he said. Being at the marina, however, Damon said - if he guesses right and the Futuro is the next hot thing - the house can be put on a barge and sent all around the world." So Futuro's clearly got moved somehow and that begs the question "where are they now?" Oh and one final video for this section - a little tongue in cheek actually. This video [Dead - it can be viewed using this link] made the rounds a while ago; it is not about Futuro but it does feature Futuro in a comparison to another video touted by some as a "real" UFO being moved - I have my opinion and I will leave you to yours.